Much of the last two decades' metafictional nattering is made to look like so much sandbox-play by Roth's new novel; if the technique of ostensibly real characters imagining they're in books (and vice-versa) has a fatal flaw, it's that neither character nor book usually tackles the unbearable alibis, transgressions, and needs--and the punishingly naked absurdity--that both art and life seem to demand. But that's what Roth, in his most virtuoso effort yet, has done here. Disenfranchisement, re-creation, and the severe guilt of independence are the I-beams of Roth's Zuckerman books--of which this is one--but never has the ceiling vaulted so high, the aim been so nervy. The earlier books were the deathbeds of novelist Zuckerman's father and mother, and it's now the turn of Nathan's dentist brother Henry to die. He does so semi-electively: rendered impotent by heart medication, he goes through with a multiple bypass that fails fatally. Yet the book's very next section, "Judea," finds Henry not dead but in Israel, on the West Bank, in thrall to a right-wing Jewish Kahane-type--and Nathan leaving his own peaceful London writer's existence to try to walk some sense into his kid brother, to get him to return home to his family. How did Henry dead turn into Henry the irrendentist? The same way, it turns out, that it's actually Nathan--in the section called "Gloucestershire"--who's died to restore his potency. Henry's story, then, is one that Nathan wrote; and Nathan's story may be the book we're reading, subject to disputes and interruptions and resentments from those closest to him, lives he has cannibalized for the art-pot. Whether Henry's, Nathan's, or Nathan's new Gentile British wife's, it isn't clear until the end which story is true, which made up--but each section (including an El Al hijacking Nathan is unwilling party to) faces another like a mirror, bringing characters back to themselves, real or not. The presiding theme, never more naked, is Jewishness, complete with Talmudic feints, discontinuous pleating (a lesson learned, one senses, from Roth's admiration for Central European fiction, Kundera and the like)--allowing Roth to write a book of intellectual argument and atavistic rejoinder that someone like Saul Bellow has been lately trying to write, without success. The Israel sections alone are brilliant reportage; in tangled context--of fictional projection, an assuaging of guilt by secular Nathan--they suggest a kind of forced and frightened choral laughter. 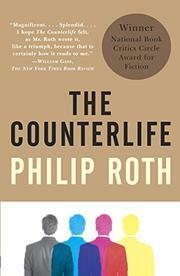 Certainly Roth's most complex, ambitious work--and one of his best.